Why Laser Cutting? ... Simple "Speed!" 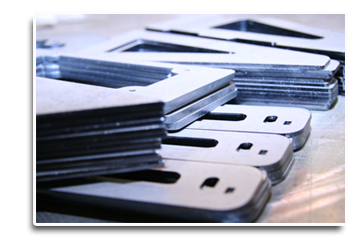 High precision of the dimensions and minimal heat distortion of the parts, along with the use of the programming software, we are able to nest� pieces together on one single sheet of metal to minimize waste and maximize efficiency resulting in first class cutting. We currently run three lasers ranging from 2800 to 5200 watts, with the capability of cutting a thickness of up to 3/8" Aluminum, 5/8" Stainless Steel and 1" Steel.